Like many families, we are familiar with Jenga. The precarious tower of carefully placed blocks sways and leans until one misplaced block causes it all to come tumbling down. Now there is a new version of Jenga, Jenga BOOM! No this game will NOT explode on your table, but you have to be quick and adept to win. There are three keys to winning this game, speed, skill and strategy. Unlike the original Jenga, this version has a specific time limit. You can't sit and ponder for an unlimited time. My kids really like Jenga BOOM. We played it on our recent family game night. They loved the part where the tower went BOOM. I think sometimes that they would wait and take their time just to see what would happen. Personally, I like the idea that there is a specified time limit for this Jenga version. It keeps the kids engaged in the moment of playing the game. Also, it develops quick thinking skills and strategy that is important to foster in kids. In our house, we encourage discussion why and where block placement is key to the game. Toy detonator gets your heart racing! Check out the fuse and the ticking mechanical timer. 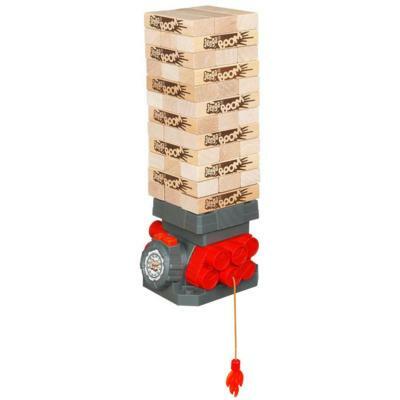 Start the timer, and stack the blocks on top of the tower— fast! The platform drops and the blocks fly. Speed, skill, and strategy keep you in the game. Challenge yourself or play with your friends. Jenga BOOM is recommended for ages 6 and up. It retails for approximately $17.99 at most major retail outlets. Would you like to add Jenga BOOM to your game library? I have a copy to give to my readers. Please use the Rafflecopter to enter. Disclosure: I received this game to review and to giveaway. All opinions are my own. The kids favorite game is Sorry. My family loves playing Connect 4. We love to play UNO Roboto. We like to play memory games with our little ones but looking to get into more options as they get older. Right now we are hooked on Uno Attack. We play a lot of different games: Monopoly, Uno, Scrabble, Lunch Money, Rummy, puzzles, Yamodo, etc. We love the game sorry! We also love uno and scrabble and rummycube! We play many different games. Monopoly, Jenga, Operation,ect. we like to play scrabble! We'll play monopoly, but it spans over a two week period. We play Yahtzee or Uni. We play a lot of Charades, do a lot of puzzles and sometimes play Monopoly. We have everything, from Monopoly to Life to Candyland. Battleship is one of many.